Hello readers. Welcome back. It is time for another update on the adventures of Tronster. I am currently in Denver Colorado. This city is amazingly clean. The air a little on the thin side and the weather is weird. It could be 50 in the morning then warm up to 70 or so during the day. Storms move in and out of the region at a rapid pace. On one of the clear days, I was able to go exploring around the foothills of the rockies. Since I am home based close to the Shenandoah Mountains, I wanted to experience the other range in the USA. So I did. The difference is evident from the outset of my adventure. I hit two touristy spots just outside of Denver. The first was the Dinosaur Ridge. Where there are dinosaur tracks all on the side of the hills. Very entertaining. 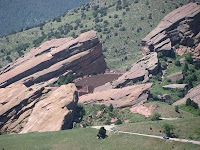 The second spot was Red Rock Amphitheater. There have been performances there since the early 1900s. Of coarse the year I was born didn't seem to have any great bands, others have played there and are playing there now. Denver also has some interesting named eateries. I have experienced a couple and plan on hitting some more before I return to Casa de Tronster. There was the "Smiling Moose" A sandwich place with good wraps and salads, The "Spicy Pickle Cafe", another excellent choice for lunch. "Nick and Willy's Pizza" A pizzeria where you can order a pizza and take it home to bake. Also really big cookies. All have solid meals and moderate pricing. Another place we see everyday is the "Fire Bowl Cafe". Hopefully I can check it out this week before I go home. Well that is about all from Denver. Have a great day.